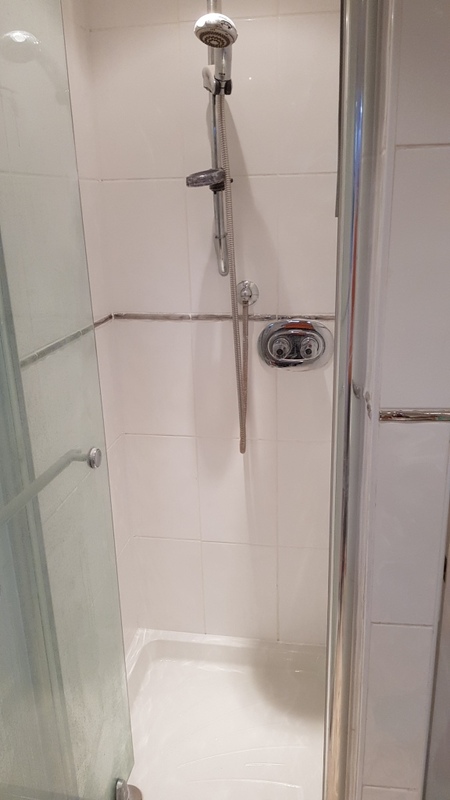 We were contacted by a family from Hillsborough, which is a suburb of Sheffield, who had seen some of the work we do renovating shower cubicles on the internet and wanted to know if I would do the same for their shower. 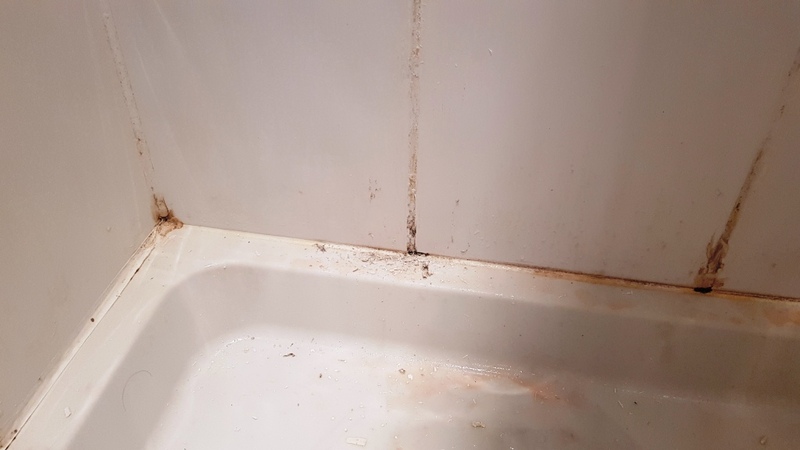 One of the biggest problems affecting bathrooms is mould which thrives in a warm damp environment, the best way to prevent it is to extract the moisture created when having a shower with adequate ventilation. Other steps you can take to reduce mould include always leaving the door open after a shower to improve cross ventilation and rinsing the shower down with cold water afterwards. Tile Doctor also have a product called Aqua-Pro that you can spray on your tiles after use. 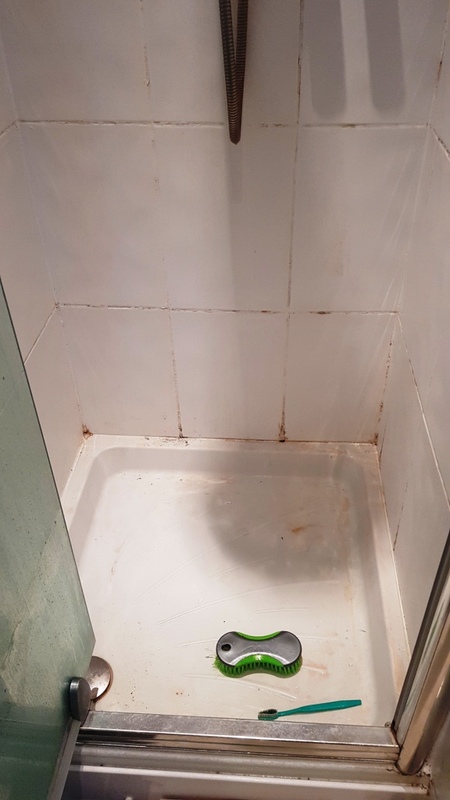 I went over to take a look and could see that the Ceramic tiles were only slightly stained and would no doubt clean-up easily however the grout had gone black in places with mould and orange in others due to the dyes in shampoos and soaps. Ceramic tiles are glazed and so usually very easy to keep clean however grout and silicone is more vulnerable and if you now cleaned on a regular basis mould can get a grip and it can prove very stubborn to remove. The home owners had tried to rectify the problem before by applying more grout and silicone to the affected areas however this hadn’t cured the ventilation issue, so it wasn’t long before the problem resurfaced. 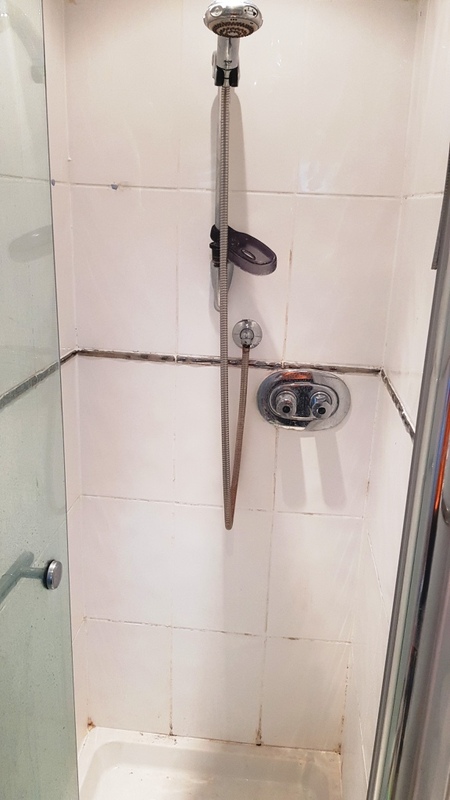 I recommended replacing all the badly affected grout and the silicone sealer strip around the base of the shower to give the cubicle a fresh look. 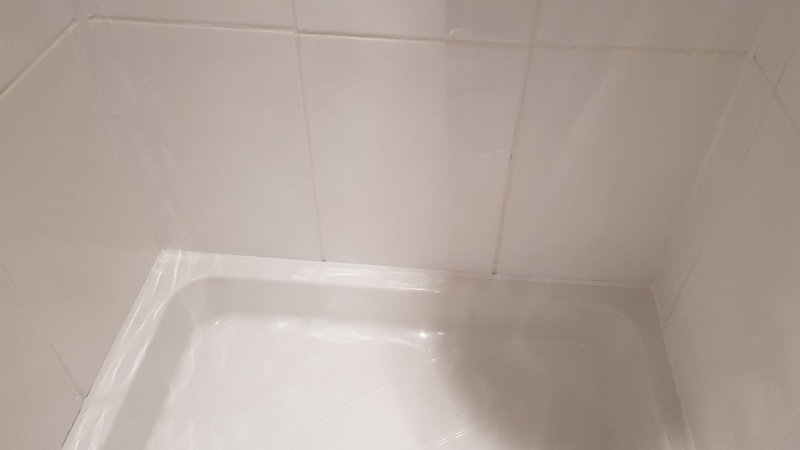 My first task was to see how far we could get by cleaning the tile and grout using Tile Doctor Duo-Clean which is designed for use in bathrooms where it’s effective at cleaning grout and removing mould. It comes in a spray bottle so it’s just a question of spraying it onto the tile, grout and silicone and leaving it for ten minutes before scrubbing it in with a stiff brush or scouring pad. The soil was then rinsed off the tile and grout and the shower left to dry off for a while, so we could see which areas were so badly stained would need re-grouting. The next step was to carefully remove the old silicone sealant from around the edges of the shower cubicle using a sharp knife, then using a combination of power tools and blades we removed the grout in the affected areas and put in new white grout to match the exiting. 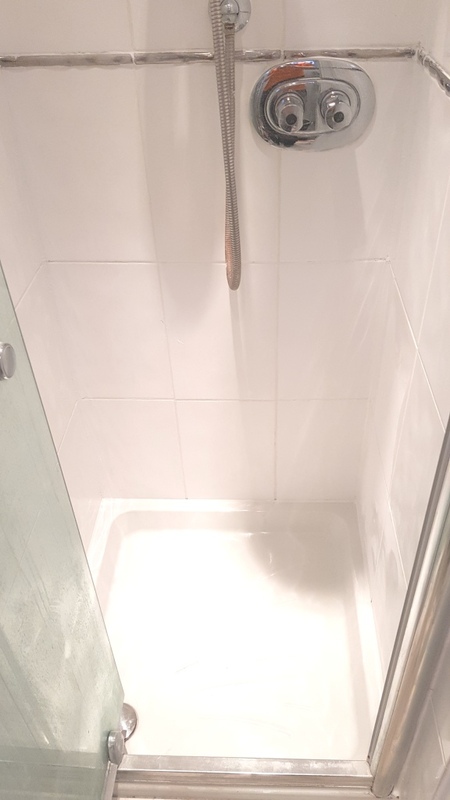 While the grout was drying, the shower tray was cleaned up and new silicone sealant has added around the base of the shower cubicle using a premium mould resistant silicone that should be more resistant to staining. The combination of cleaning and grout replacement worked a treat and the shower looks like a brand-new installation. This doesn’t resolve the ventilation issue, so I left the customer with a bottle of Tile Doctor Aqua-Pro with instructions to spray the tiles down regularly in order to keep it looking fresh and clean. Matt was brilliant. The job was much harder than he anticipated, but he was a complete professional, answering our questions, solving the problems, braving the elements to get to us and leaving us with a beautiful floor. He is such a hard worker and always cheerful. I cannot recommend him highly enough. Matt has done an excellent job of cleaning, regrouting and sealing my very old Pamment clay tile floor. The job was certainly challenging with some issues with efflorescence typical of this old floor laid on sand. Matt gave a detailed quote with intended job schedule - which he finished ahead of time and reduced the price. Matt also kindly gave me some other cleaner to clean a sandstone step elsewhere in the house, and the leftover sealant for me to touch up the pamments later. Overall we are very happy indeed with the new lease of life our floor has been given, which should also make looking after it easier. Quick to respond to my initial contact. The floor paused a few problems which Matthew was able to overcome leaving a great finish to the natural slate flooring. I contacted The Tile Doctor to see if I could find a specialist cleaner to deep clean my very marked and dirty tiled hall floor. The man I spoke to was polite and efficient and said he'd give my details to Matt who covered my area. Matt called me back the same day and arranged a visit to have a look at the floor and give me a quote. He was punctual and talked me through the whole cleaning process and what I would need to do to prepare for the deep clean ( moving and protecting antique furniture etc). A date was arranged and the following day he emailed me a quote. Matt was professional throughout his visit to clean the floor and went far beyond my expectations to find the right chemical cleaner to remove stubborn grout marks. I am very pleased with the results he got . The floor looks like new. I would highly recommend him to anyone needing this service. I would definitely use him again. I am very, very happy with the speed of response, the manner of response and the overall service. I also think that the floor looks great. I am probably being picky but I just have a slight niggle that there are a few small areas that have a look of being unfinished i.e. needing a filler or grouting. For example the join between the edge of the wooden floor and the tiles, there are a couple of corner, cracked tiles that could have been grouted and I don't really think it should be left to me to do these finishing touches or to point them out as needing doing.But overall it looks great, thank you.